During the second trimester of Mandarin, PK students have continued learning numbers up to the hundreds, and focused on learning to write and recognize the characters from 1 to 10, all that is needed to write up to 99. Students enjoyed counting while playing “hot potato” numbers. We read In the Leaves, by Huy Voun Lee, and examined Chinese characters introduced, such as “autumn,” which is made up of a grain radical and a fire radical. Students decorated “peace” characters for winter break. We learned more about pandas and officially adopted our own panda in China. Much of the trimester was spent learning about and celebrating the Chinese New Year, which lasts two weeks, ending with the Lantern Festival. Students learned the story of the twelve-year cycle of animals and how to say each animal in Chinese, and act them out while playing Chinese style “Simon Says.” Students also learned how to ask and answer what animal year they belong to. They met the Chinese lion and learned the “Gong Xi” song. 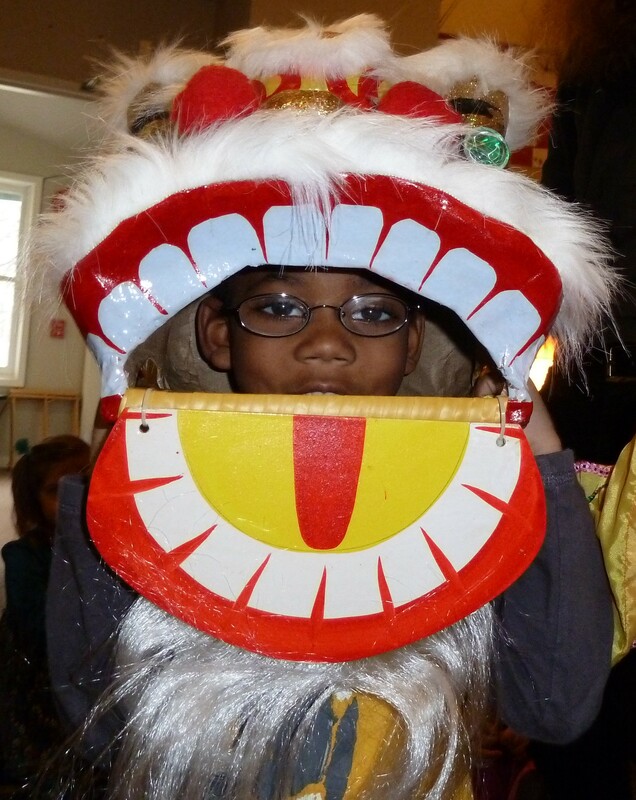 Later, students took turns doing lion dances to celebrate the Spring Festival. They also made “hongbao” for lucky money and candy, and lanterns for the Lantern Festival, while focusing on learning the colors. They also learned to stand if they were wearing a certain color and say the color, as well as “it’s here,” when asked “where is it?” Your kids are doing wonderfully and we have been having a lot of fun!